Engaging with refugees with multiple and complex needs to provide a range of holistic, intensive and enhanced support activities, adding significant value to the limited refugee integration provision and improving integration outcomes. 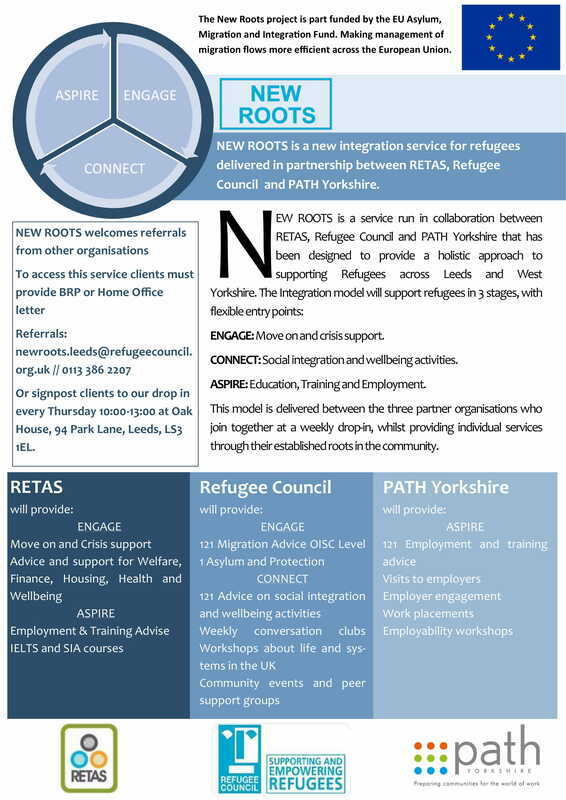 RETAS in partnership with the Refugee Council, HCAS (Humber Community Advice Services), Path Yorkshire and the Goodwin Trust applied for Asylum, Migration and Integration Fund (AMIF) funding to roll out a model of integration for refugees who have status based in London, Leeds and Hull called New Roots. The project aims to engage with 3,568 refugees with multiple and complex needs over a period of two years, providing a range of holistic, intensive and enhanced support activities, adding significant value to the limited refugee integration provision in each area and improving integration outcomes. Connect: social integration, language and wellbeing activities. Aspire: training, volunteering and employment opportunities. RETAS delivers two of the three stages of support as part of the New Roots Project: Aspire, which focuses on education and employment advice and Engage, which helps with move on and crisis advice. This builds on our 28 Day Transition Project and links up the work we do within this, with service users outside of the 28 day transition period. Who is eligible for this project? As well as being referred, individuals can access support on the New Roots Project by attending our multi-agency drop-in on a Thursday 10am - 1pm at Oak House. Staff from all three partners will be available every week to support individuals with their needs. More information is available on the below flyers and a pdf of these can be downloaded below.